The Bonner Foundation staff and Trustees have authored or contributed to a series of publications related to the Bonner Program model and campus-wide community engagement. Below are brief descriptions of each along with a link to the publication for order or download. This book showcases student reflections on what it means to be a Bonner Scholar, featuring quotes collected from more than 1,500 students across 25 colleges and universities. It begins with two short chapters that describe the Bonner Scholar and Leader Program model and its goals and core frameworks including providing an “Access to Education, Opportunity to Serve,” and to “Change the Count” by making an impact on the capacity of local community organizations and issues. This short publication was a tribute to Mrs. Corella Allen Bonner to celebrate her life and passing. It captures a slice of her history growing up in the coal mining towns of Kentucky and West Virginia, then moving to Detroit where she met Bertram F. Bonner. It includes several moving tributes given by students, staff, and college leaders at her memorial service in 2002. This special edition of the Michigan Journal of Community Service Learning was a product of two Learn & Serve America grants awarded by the Corporation for National and Community Service to the Bonner Foundation from 1997 to 2003. Articles in this volume include: Principles of Best Practice for Community-Based Research by the editors; Opportunities and Pitfalls of Community-Based Research: A Case Study; Negotiating Community-Based Research: A Case Study of the "Life's Work" Project; The Student's Role in Community-Based Research; Community-Based Research Networks: Development and Lessons Learned in an Emerging Field; Community-Based Research Assessments: Some Principles and Practices; and Community-Based Research: Celebration and Concern. Community-Based Research and Higher Education" describes how to incorporate a powerful and promising new form of scholarship into academic settings. The book presents a model of community-based research (CBR) that engages community members with students and faculty in the course of their academic work. Unlike traditional academic research, CBR is collaborative and change-oriented and finds its research questions in the needs of communities. This dynamic research model combines classroom learning with social action in ways that can ultimately empower community groups to address their own agendas and shape their own futures. Community-Based Research and Higher Education is written by five engaged scholars from different disciplines with extensive experience in community-based research as teachers, researchers, administrators, scholars, and community activists. They draw on their own and others' experience to develop concrete guidelines for creating and sustaining partnerships through CBR projects as they also outline the principles that guide decisions about research design and methods. The authors offer extensive practical suggestions for incorporating CBR into courses and curricula. This publication was designed as a tool for enhancing education and reflection, especially on civic and political engagement, within the Bonner Program and campus-wide contexts. The book was one of the Bonner Foundation’s resources intended to deepen student learning, especially so that they would be involved in elections, advocacy, and broader citizen involvement. The book features nine chapters exploring a number of themes such as identity, family influences, social justice, poverty, voting, public policy, advocacy, international experiences, and connections between service and academic study. Each chapter includes short essays that highlight such themes written by students in the Bonner Scholar and Leader Program. Students from 32 colleges and universities are featured. Additionally, reflection exercises, videos, books, and other educational materials are provided for each theme. Written in conjunction with the Bonner Foundation’s work on a model for civic engagement minors, certificates, and academic programs, this issue of AAC&U’s Diversity Digest featured articles from staff, faculty, leaders, and students across the network. The issue was perhaps the first time that the Bonner Program model was highlighted in a national higher education publication. Articles described the four-year developmental model for students and capacity building community partnerships. They also showcased its value and strategies for faculty engagement, institutional change, and curriculum transformation. Leaders like Elizabeth Paul, veteran of TCNJ and Stetson and now president of Capital University, shared a faculty perspective on the value of the model. Alumni like Matt Morton, who went on to complete a Rhodes Scholarship and doctoral work influenced by his Bonner experience, discussed the impact of the program. In 2004, the Bonner Foundation began work with 15 campuses to create a model for civic engagement minors, concentrations, and academic programs, with support from the U.S. Department of Education and its Fund for Improvement of Post Secondary Education (FIPSE). In 2008, Civic Engagement at the Center captured this model. Moreover, the monograph shared the broader Bonner student developmental model and its potential for enhancing students’ civic learning and socially responsible leadership to a national higher education audience. First, the monograph describes key elements of the Bonner Program’s developmental co-curricular model, drawing on research about its impact on students. Then, it introduces the architecture of emerging civic engagement minors, certificates, and academic programs, drawing on the common elements from programs at fifteen colleges and universities. Additionally, lessons learned about the process of developing and approving such academic programs are shared. This article also shared findings from the seven-year longitudinal studies of the impact of Bonner Program participation on students and graduates. High financial need Bonner scholarship alumni, who had been engaged in four years of co-curricular service and reflection experiences, were surveyed six years after graduation. Survey questions drawn from UCLA’s Life After College Survey allowed comparison with three national groups. All Bonner service-learning program graduates were still doing community service six years after graduation compared to approximately two-thirds of each comparison group. Alumni were more also likely than comparison groups to be civically engaged, particularly in activities requiring dialogue. The importance of sustained dialogue across boundaries of perceived difference is discussed. This article presents the findings from a seven year longitudinal study of college students in the Bonner Scholar Program across 25 colleges and universities. It draws on data gathered through the pre-, mid-point, and end-point Student Impact Surveys, designed to gauge the impacts of four years of involvement on desired college outcomes. Outcomes examined included values, civic behaviors and citizenship, leadership, diversity and dialogue across difference, with clear positive impacts in all of these areas. This study’s findings suggest that the core developmental experience of service is augmented by sustained education, reflection, and dialogue across boundaries of perceived difference that happens with people students serve, with the people they serve alongside of, with their supervisors at the service site, with the college staff and faculty, and, centrally, with their peers. This study affirms the powerful impacts of a development multi-year cocurricular service experience on students’ learning during and after college. Prepared for the 20th Anniversary Celebration of the Bonner Program held at Berea College, this volume features "big ideas" proposed and carried out by every Congress Representatives to improve their campus program and the communities in which they serve. The work behind each of these big ideas is nothing short of inspirational. This booklet is the culmination of hundreds, if not thousands, of brainstorms, action plans, teams, and collaborations, that have come together to produce beautiful and powerful outcomes. The “Big Ideas” have proven not only to serve as more tangible goals for our time as Congress Representatives, but also as the motivation and framework to do incredible work on our campuses and communities. As of 2012, there were more than 50 minors, certificates, and academic programs designed around civic engagement. The Engaged Campus, a volume edited by Dan Butin, offers a set of emerging best practices and articulation of critical issues for faculty and administrators committed to developing, strengthening, or expanding majors or minors in community engagement at their respective institutions. As a respondent chapter within the volume, “Disciplining Higher Education for Community Engagement” argued that the conventional form of service-learning courses must be augmented through a sustained, scaffolded experience tied to both curricular and cocurricular engagement. Deepening Community Engagement in Higher Education discusses how colleges and universities can increase the engagement of their students, faculty, and institutional resources in their communities. This volume features strategies to make civic engagement deep, pervasive, integrated, and developmental – qualities that must be demonstrated by campuses for successfully gaining the Carnegie Community Engagement Classification. Chapters by leaders, faculty, and practitioners from more than a dozen colleges and universities (including Allegheny, Bates, Berea, Emory & Henry, Oberlin, TCNJ, and Washburn) and scholars from the Bonner Foundation, CIRCLE, and NERCHE describe new frameworks and strategies for student development, community partnerships, and campus infrastructure. Authors include Ariane Hoy, Abby Kiesa, Mathew Johnson, John Saltmarsh, and Marshall Welch. Chapters share best practices for engaging and developing faculty, for integrating social media to advance engagement, for long-term strategic planning that links civic work to institutional mission, and for high-impact civic engagement. This online publication featured articles from a number of different authors reflecting on the accomplishments and emerging new directions of the Bonner Program’s work and civic engagement on campuses. For instance, Caryn McTighe Musil, Senior Vice President at AAC&U, reflected on the work of the Civic Learning and Democratic Engagement (CLDE) consortium and various initiatives to make civic learning and engagement deeper and more pervasive. Robert Hackett, President of the Bonner Foundation, shared reflections on the program’s founding commitments and the growing centrality for civic engagement. Carol Quillen, President of Davidson College, shared insights on the impact of the 25 year old program at her institution. Jamé Johnson of the Meadville school district and a partner to Allegheny College reflected on the transformative potential of collaboration through Bonner and the High-Impact Initiative. The issue highlights a number of ways in which community engagement has begun to reshape undergraduate education. This publication, created for the 25th Anniversary of the Bonner Program, highlights the achievements and programs at more than 65 colleges and universities that run the Bonner Scholar or Bonner Leader Program. An introductory section provides an overview of the Bonner Program model, spotlighting student leadership, the intensity of the service experience, and related impacts on community capacity. Each of the colleges and universities in the network is profiled, with an overview of the institution’s mission, center for civic engagement, students in the Bonner Program, and unique community partnerships and campus programs, as well as photos. This is a great resource to learn more about the Bonner network. The Bonner Foundation worked in partnership with the Association of American Colleges and Universities to produce an issue of AAC&U’s quarterly journal. The issue introduced the aspiration of Community Engaged Signature Work, a culminating integrative learning experience for undergraduates, but suggesting it could have a real-world civic impact. Articles by scholars and practitioners at Allegheny College, Emory & Henry College, Loyola University, Portland State University, and other institutions punctuated effective strategies for curriculum and institutional change. 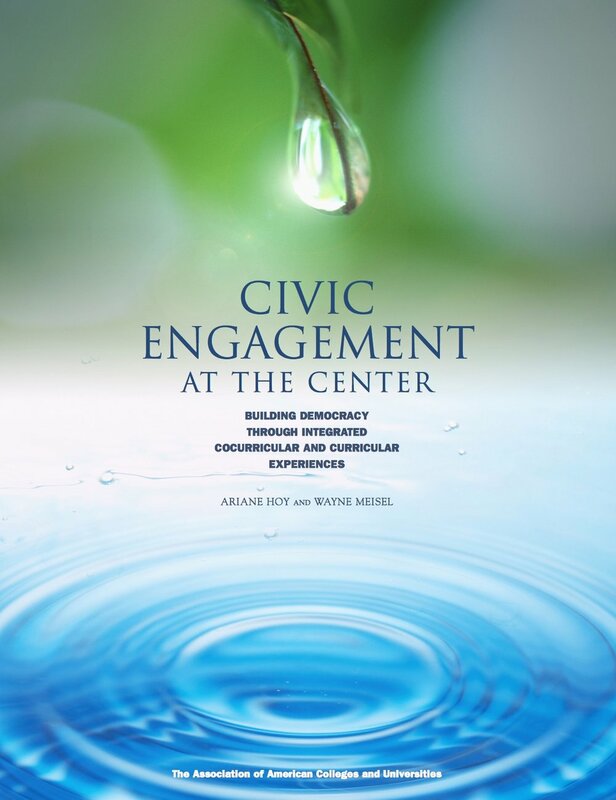 Ashley Finley and Bob Breason discussed the most current evidence for the value of civic engagement, which ties it to well-being and flourishing. Bonner alumni Katie Beck and Jonathan Franklin provided compelling examples of their own Signature Work and its impact on their future career choices. This chapter within The Cambridge Handbook of Service Learning and Civic Engagement edited by Corey Dolgon, Timothy Eatman, and Tania Mitchell focuses on the history and significance of organizations like the Bonner Foundation, Campus Compact, and Learn & Serve America in the national civic engagement movement. It describes the roles that external support organizations in the civic and higher education space have and must play to foster its continual success and reinvention. This study, published in the Michigan Journal of Community Service Learning, explores the relationship between participation in college service-learning (SL) experiences, in both academic courses and co-curricular programs, and post-college civic engagement and behaviors. Using data from a purposeful sample of 1,066 alumni from 30 campuses who participated in the 20th Anniversary Bonner Scholars Study, researchers explored the extent to which these experiences during college were related to post-graduate civic-minded orientations, volunteering, and civic action. When evaluating various attributes of these programs (e.g., curricular, co-curricular programming, types and intensity of reflection, dialogue across difference, interactions with others), two components were particularly salient. Dialogue with others across difference was the strongest predictor of cultivating civic outcomes after college. In addition, both structured and informal reflection independently contributed to civic outcomes (i.e., civic-mindedness, voluntary action, civic action). The results suggested a Pathways to Adult Civic Engagement (PACE) model, which can be used to examine community engagement programming in higher education. This brief tract urges trustees and leaders of America's liberal arts colleges to knit your college back together again by returning to the liberal arts’ ancient goal that still prevailed in John Adams’ day – the goal of lighting students’ minds for ethical and civic action. "More than ever today," the authors argue, "America needs men and women who, by force of word and dint of character, offset the popular media, raise the level of public debate, and repair the civic fabric of splintered communities." John Kuykendall, one of the co-authors, is President Emeritus of Davidson College and a current member of the Bonner Foundation Board of Trustees.